Deliver To is used to copy an object that has been created or modified on a Visual LANSA on Windows installation to a Deployment System. You can Deliver LANSA objects such as processes, functions, files, fields, reusable parts and variables. When the Deployment System is a Linux build environment you can also deliver message files. 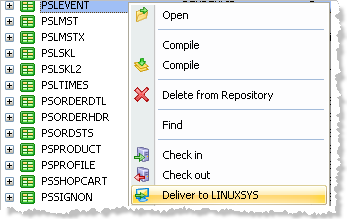 To Deliver LANSA objects, you can use the Repository tab and right click on the object(s). The 5.16.1 Deliver To Options will be displayed in the pop-up menu. Editor Lists can also be selected to deliver the object(s) associated with the list definition.